Its comes no surprise that wire mesh storage lockers prove to be a wonderful light weight storage option for businesses especially with safety factor on cards in order to safeguard personal belongings and office equipments being shared with one another. It happens all the time at workplace premises when equipments lie here and there post use. With such lockers it is absolutely easy to have even the biggest things placed with great ease especially when supplied by well known storage lockers supplier from UK. With so many openings present such lockers can have wide range of things accommodated irrespective of the sizes. There is a great deal of ventilation offered by wire mesh lockers and hence wet items can be stored with ease since there is a lot of room for air to penetrate drying up the moist environment. Such lockers are ideal for damp clothing and uniforms. When you have individual locker assigned to each individual, there is absolute no way employees or coworkers need to worry about safeguarding the valuables from one another. Reserve a safe for every individual so that your employees do not need to keep things at home. Such lockers are very much helpful when it comes to supporting things that are not only big but also heavy to deal with. This can mean machinery or even tools that would protect such equipments from major damages especially when workers are not well trained to handle the same. 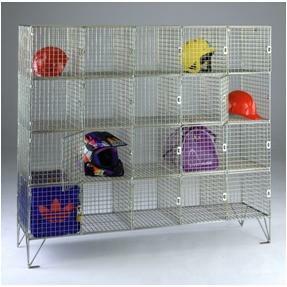 Since these lockers are made up of wire mesh, you can have them made as per your requirements no matter how big or small you want. You can also have the number of openings you want accompanied with varied opening sizes. Since the locker host an open design, one can keep an eye on the things stored inside. This makes the whole design model so convenient for easy access of things kept on the inside, resulting in prevention of items out of sight and hence recommended by every UK based storage lockers supplier. Not just industrial usage but such lockers are extremely useful even for a residential use. A landlord needs to have a fully secured storage facility provided to the tenants, and what better than wire mesh storage lockers bought from a reputed storage lockers supplier from UK. Such lockers can be easily be setup in a basement or a place where there is a need to keep stuff being a misfit to the actual apartment. This entry was posted on Monday, April 1st, 2019 at 5:50 am	and is filed under Storage Lockers. You can follow any comments to this entry through the RSS 2.0 feed. Both comments and pings are currently closed.